Our felt products are used in the production of NAS batteries. 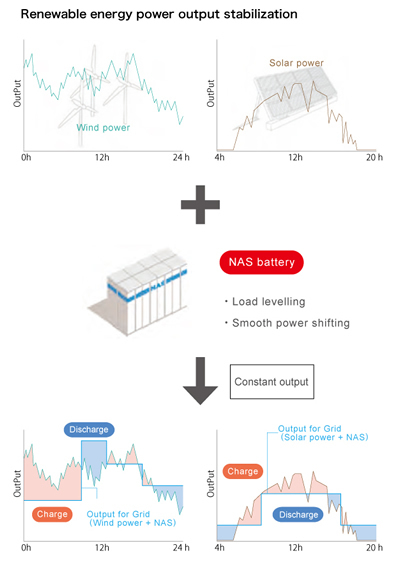 A NAS battery is a highly efficient and energy dense secondary battery. NAS batteries are most often used for providing power at night, during power outages or emergencies. They also help to provide a more stable power output when used with renewable energy sources such as wind and solar power. They work to save energy, reduce costs and impact to the environment. 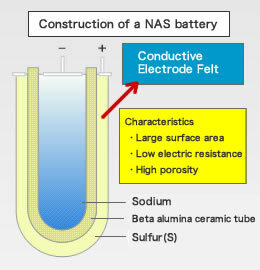 Our electrode felt was developed using advanced and precise technology and is used at the heart of NAS battery technology. We also produce a high performance carbon felt that can be used to insulate high temperature furnaces including silicone melting furnaces used in the production of solar power panels.